Known for bringing vision and attitude to Cisco's collaboration business, Trollope now heads to Five9, where he'll test his contact center chops. Change is a good thing, or so the saying goes. If that's the case, the collaboration industry has never been healthier, as change seems constant. This week big news surfaced regarding changing leadership at a major collaboration vendor, Cisco, and an up-and-comer, Five9. On Tuesday, May 1, coinciding with its quarterly earnings release, cloud contact center vendor Five9 announced that current Cisco SVP and GM of Applications, Rowan Trollope, will be its new CEO, effective Thursday, May 3. Trollope will take the helm from Barry Zwarenstein, Five9's interim CEO and CFO. Zwarenstein took the helm when the company's longtime CEO, Mike Burkland, stepped down because of health issues. Burkland, who retains his position as executive chairman, was an outstanding CEO for Five9. During his tenure, revenue grew by about 20x, to more than $200 million, while value increased more than 100x -- so his continued involvement is certainly a positive. After Trollope's arrival, Zwarenstein will remain in his role as CFO. Also on Tuesday afternoon, Cisco announced its intent to acquire privately held Accompany, for its artificial intelligence-driven relationship intelligence platform, for $270 million in cash and assets (see related No Jitter post). Accompany CEO and founder, Amy Chang, will assume the role of SVP of the Collaboration Technology Group (CTG) at Cisco. The acquisition is expected to close this quarter, which is Cisco's fiscal fourth quarter of 2018. Accompany's AI platform is for building relationships, finding prospects, and selling. Given Cisco is all-in with AI, the acquisition makes some sense. Chang has been leading the Los Gatos, Calif., company since 2013, and has been on Cisco's board since 2016. She will resign from the board as part of joining Cisco. There's no question that Trollope will be missed at Cisco. When he joined the company in 2012, the collaboration business had stalled due to a downturn in telepresence sales. Since then, Cisco revamped the collaboration portfolio, and has won a number of Red Dot Awards for design. Also, Cisco now has a real cloud story, AI strategy developer program, consistent APIs, and a broad ecosystem of partners -- all things it had lacked six years ago. CTG is growing nicely, has a strong base of recurring revenue, and has been a big contributor to the stock's return to growth. Most importantly, though, Trollope brought a vision for collaboration and attitude the company had not previously had. You could argue that Trollope has been the single, most influential person in collaboration over the past half-decade. His obsession with ease of use and simplicity took Cisco's products in an entirely new direction. I recall how annoyed Trollope got during one of my first meetings with him -- the problem being how long it took to find the link to join a WebEx (now Webex) session. He told me, "There should be a big button at the top of the invite that says, 'Join Meeting'" -- and now there is. I remember thinking Trollope thought unlike anyone else I had ever met at Cisco. So where does Cisco go from here? I don't know Chang, but her profile seems to fit nicely into the AI-oriented future of collaboration (the importance of which Trollope has been talking about for a while now). As I've written previously on No Jitter, I believe the market leaders in collaboration (and all markets) will be the ones with the data and the AI systems to interpret that data to find new insights. Chang's background and the Accompany platform will help Cisco evolve the way people collaborate with one another by making Webex and Cisco meetings smarter. Given the inflection point in collaboration to be more AI-driven, the handoff in leadership appears to be well-timed. Trollope's move to Five9 is certainly interesting -- and unexpected, given he isn't thought of a contact center person and that being the one area of collaboration about which he rarely talked. It appears that sometime over the past few months he got religion with contact center to the point where he decided to run a company that's solely focused on it. Unexpected as the move is, it has tremendous potential for Trollope and Five9. Trollope will be an outstanding leader for Five9. Team members at Cisco speak highly of him, and have loved working for him. I expect the same will happen at his new company. 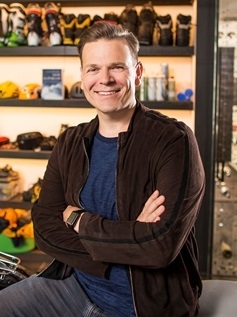 His focus on simplicity, ease of use, quality of experience, and how to use the data in the cloud to create differentiated experiences will work well at Five9. His experience with AI will be beneficial, too. As Five9 discussed earlier this year at its analyst summit, it considers AI a gamechanger in customer service. Also, most of the leadership team at Five9 has been in place for a while. A new person can help elevate the thinking of the company. Five9 has been one of the poster children for the cloud, and the company has seen phenomenal growth in both revenue and stock price over the past several years. Three years ago, the stock was at about $5 per share. Today it sits at about $30 per share, so you might look at that and wonder, "Why change?" Here's where I will applaud Five9 for going outside to hire its new CEO. It's easy to sit on your laurels and assume success yesterday equals success tomorrow, but it doesn't. Digital transformation dictates that as the market changes, the company must evolve. In fact, the only new talent into Five9's leadership team in recent history has been in marketing, where Niki Hall, VP of corporate marketing, and her team have done a great job of tying Five9 to digital trends and giving the company a new look. The current website looks like it was designed 20 years ago -- but watch for a a new one, coming in a few weeks, that's much more modern and in line with today's market trends. The willingness to change in the face of success is the hallmark of a strong leadership team, and Trollope will certainly bring change. Five9 just crossed the $200 million revenue mark, and Trollope's mission will be to keep that growth and hit the billion-dollar mark. It will be interesting to see how he fares at Five9, where he won't have the same level of resources, large customer base, and the massive channel of a Cisco. Change is certainly a good thing, and for companies to stay healthy, change is necessary. Trollope's move to Five9 and Chang's to Cisco shakes things up, but could be beneficial to both companies.